Stephen C. Kales joined NCATS in June 2014 as a biologist. Drawing on his diverse background in biological systems, Kales collaborates to develop a rich target portfolio, including projects in oncology, neurobiology and epigenetics. 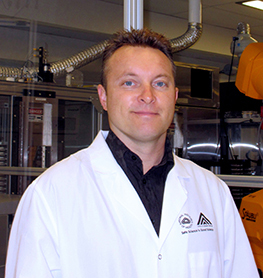 Born and raised in Canada, Kales received his Ph.D. in biology from the University of Waterloo before joining the National Cancer Institute (NCI) as a research fellow. During his time at NCI’s Women’s Malignancies Branch and Laboratory of Cellular and Molecular Biology, Kales investigated the role of novel mutations and protein-protein interactions on growth factor receptor signaling complexes in solid tumor development.